The Chattanooga Holistic Animal Institute opened on the Southside’s Main Street in May 2012, and the last two years have been so successful, according to founder Colleen Smith, DVM, CVA, CVCP, that a celebration is called for. It will take place July 12 from noon to 5 p.m. at the clinic, located at 918 E. Main Street. CHAI is welcoming a new holistic vet, Dr. Katie Smithson, who is also a certified animal acupuncturist, and the institute will now be open Monday-Friday from 8 a.m. to 6 p.m. “Dr. Smithson is also an expert in nutrition as well as the advances in stem cell research,” said Dr. Smith. Other new members have joined the CHAI staff and are eager to meet established and new CHAI patrons including CHAI’s mobile housecall veterinarian, Dr.
Shannon Dawkins, who shares the ideals and philosophies of CHAI and has a special interest in exotics. She services Chattanooga and North Georgia areas and currently performs surgeries weekly at CHAI. A larger support staff has also been added to better accommodate the growing clientele. "Ms. Mills has the advantage," said Dr. Smith, "of also being a licensed veterinary technician, knowledge she uses to monitor for possible health issues other groomers may not be trained to recognize. She is also a Reiki master, which she utilizes to help to keep her grooming patients relaxed during their services." The July 12 event will feature facility tours, light refreshments, games, prizes, area vendors, and rescue groups offering information about their services and ways to adopt or foster animals. “The grand prize will be a five-session acupuncture package that’s valued at $750,” says Dr. Smith. CHAI offers veterinary acupuncture, veterinary chiropractic, nutrition therapy, laser therapy, green grooming, awake dental procedures, surgery, stem cell, prolotherapy, digital X-ray, vaccinations and vaccine titers, general medicine, canine Tui-na massage, Reiki, and nutritional supplements. Dr. Smith graduated from Ross University School of Veterinary Medicine. She is a certified veterinary acupuncturist from the International Veterinary Acupuncture Society and a certified veterinary chiropractitioner in Veterinary Orthopedic Manipulation. 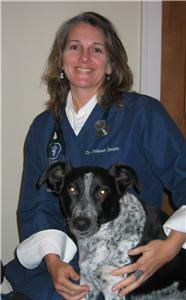 She also trained in nutrition therapy, using traditional Chinese veterinary medicine diagnosis and treatments. For more information, call (423) 531-8899.